If you like water sports like swimming, surfing, and diving, you need a watch that can go with you into any activity you choose. 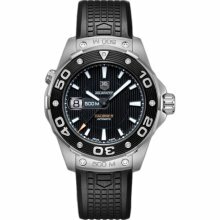 The Aquaracer 500 M WAJ2110.FT6015 by TAG Heuer is a watch to look at. This watch has a great design and several features that make it well-suited for the water sports enthusiast. 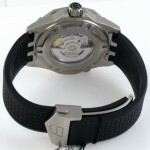 Besides all of the well-planned dive friendly features of this watch, it looks great, too! The Aquaracer series is a favorite of Leonardo Di Caprio, who has adopted some models to generate royalties for environmental causes. This watch has classic black and brushed stainless steel components to complement any wardrobe from sportswear to suits without being overly flashy. If you prefer an all metal look, consider TAG Heuer WAJ2111.BA0870 with a stainless band and silver dial. Pros: This watch can go anywhere you want it to, from 500 meters underwater to social events after work. It is durable, functional, and yet good looking and easy to read. As high end diving watches go, the price is reasonable. 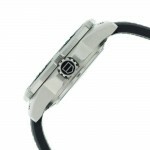 You can find this watch for $2050-2850 from several retailers. Cons: Like any good diving equipment, this watch will take some maintenance and care. In order to maintain the water-tight seals TAG Heuer recommends annual maintenance at a qualified service center. Regular wear will keep the automatic movement powered and accurate, but if you don’t intend to wear it often, resetting the movement may affect the water seals. Bear this in mind when choosing which model you purchase. The exact watch is also available in a quartz battery movement (WAJ1110.FT6015) if you prefer. For a watch that will go anywhere you go, the Aquaracer 500 M WAJ2110.FT6015 is a great choice.